UPDATE 6pm Nov. 26: Eric Bauman will take a leave of absence, effective Monday, to ensure the independence and integrity of the investigation, Cal Dem officials announced. Second-Vice Chair Alex Gallardo-Rooker—who was also reportedly investigated for taking money from the dialysis industry to oppose Prop. 8 without disclosing the contributions—will serve as interim chair. 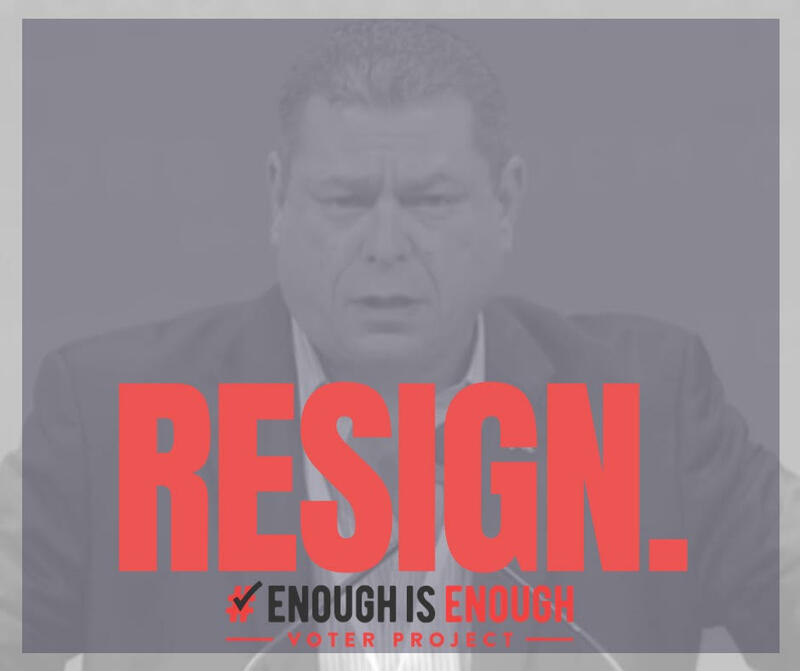 Meanwhile, the Enough is Enough Voter Project—a national political action committee dedicated to removing leaders who tolerate, commit or condone sexual violence—has formally called on Bauman to resign. The California Democratic Party took a full day to publicly address claims that its top official sexually assaulted and harassed several men. When Cal Dem finally got around to issuing a response Saturday night, it had the accused—Chairman Eric Bauman—speak on the organization’s behalf. He promised that the party would model how to react to these kinds of allegations, to ensure fairness and determine truth. He assured that there are procedures in place to deal with these issues and that an independent law firm would make sure they’re followed. “I look forward to putting these allegations behind us and moving forward as unified Democrats,” Bauman concluded. Absent from the statement was any denial. Or much in the way of specifics. It didn’t name the outside counsel that would review the claims, although the Los Angeles Times reported today that Debra Henshaw Vierra from law firm Churchwell White was assigned to the task and party spokesman Michael Roth confirmed as much in a follow-up email. It said nothing about whether Bauman would be placed on leave pending the investigation; nothing to inform potential victims about how to report misconduct. While the state party closed ranks, the California Young Democrats echoed the Women’s Caucus by saying they stand with survivors. Accusations against Bauman—the state party’s first openly gay chairman and a veteran political activist from Los Angeles—came just weeks after Democrats celebrated huge victories at the ballot box. They trace back to a letter penned by Cal Dem second-Vice Chair Daracka Larimore-Hall, the party’s third-in-command, who said two staffers approached him at the prior weekend’s executive board meeting with “serious and credible” charges that Bauman sexually assaulted and harassed men at political functions and tried to intimidate them into silence. Some of the claims reportedly involve excessive drinking and stem from events leading up to the midterm elections. Sources who spoke to San Jose Inside in recent days said Bauman’s misconduct was well known and long known among party officials, and that multiple board members tried to get Bauman to undergo counseling. In the days since San Jose Inside reported on the claims brought by Larimore-Hall, several Dem Party chapters throughout the state have called on Bauman to step aside for the duration of the investigation—or to resign altogether. Dave Campos, who chairs the San Francisco Democratic Party and works as a deputy Santa Clara County executive, told the Bay Area Reporter that he believes Bauman should take a leave of absence. Meanwhile, a number of party delegates have reacted to them by rehashing the race between Bauman and Kimberly Ellis, his more progressive challenger who lost the chairmanship by a margin of 62 votes out of a total 3,000 in 2017. Others wondered about the timing and veracity of the claims, or questioned the motives of the accusers, of Larimore-Hall and pretty much anyone else who amplified the allegations. Rep. Ro Khanna (D-Fremont), whose late-Friday tweet about Larimore-Hall’s memo introduced the controversy to a wide audience, fielded criticism for politicizing the issue by using it to promote his preferred chair: Stanford University law professor Michele Dauber, a renowned scholar on gender equity, head of the Enough is Enough Voter Project and leader of the nationally watched Recall Persky campaign. There is no one who has done more for victims than @mldauber. She led the Emily Doe effort on the Brock Turner case. We need better procedures to protect victims, and we need folks like Dauber in leadership to improve California’s process and clean house. Dauber thanked him for his support, but said her focus is on ensuring justice for the victims and making sure the Democratic Party improves the way it responds to these kinds of allegations. For one thing, she argued, it’s inappropriate that the party’s first public statement about the allegations came from the accused. That last sentence really illustrates the issue with the accused making the press stmt. "Can't wait to put this behind us" is not an appropriate statement for the organization to make at the start of an investigation of potentially serious and even possibly criminal misconduct. In recent days, however, the party has been criticized over its lack of transparency when the allegations involve Bauman. Omar Torres, an elected member of Cal Dem’s executive board representing Assembly districts in Santa Clara County, said he was disappointed by how slow the party was to respond. Especially considering that Larimore-Hall informed them of the claims several days before his “statement of charges” memo leaked. “I have been texted, called and emailed from various state delegates about these accusations and not our party leadership,” Torres told San Jose Inside over the weekend. Larimore-Hall and the Women’s Caucus volunteered more information than the party’s spokespeople. In a second public letter about the allegations released Saturday morning—several hours before Bauman’s email—he offered additional details about what led to him filing a complaint against the party chair and initiating the process to replace him. He asked fellow Democrats to honor the accusers by respecting their wish for privacy. After Bauman ignored his demand to bow out, Larimore-Hall said, he filed charges for his removal with party Secretary Jenny Bach. According to the party’s bylaws, Bauman has 10 days from receiving Larimore-Hall’s “statement of charges” notice to resign or respond. If Bauman chooses to step down, Vice Chair Alexandra Gallardo-Rooker would fill his role until the party elects a new chair at its next executive board meeting in May. Omar, pay your fine yet? You’re so obsessed with Omar huh? It’s getting old. I love how there are times you talk to yourself on here. The joke is on you. bertlovesomar aka James Rowen loves Omar. Why you so obsessed with him? > In recent days, however, the party has been criticized over its lack of transparency when the allegations involve Bauman. How come there is no law enforcement involvement? Is none of this stuff illegal? This looks to me like a freaking cult. Did California learning NOTHING from Jim Jones and the People’s Temple? Sheriff? Police Department? DIstrict Attorney? Hello? Anyone? Ted Smith rule applies. So we will read all about it. > Ted Smith rule applies. > Ted Smith rule applies. So we will read all about it. I don’t see how the Ted Smith rule applies UNLESS there is a complaint filed and law enforcement gets involved. If it’s a “private, internal investigation’ conducted by a Democrat Party hired lawyer and controlled by political apparatchiks, it will just be a political cover up. An investigation of this nature will necessarily have to look at phone and email records and that will ONLY occur if law enforcement has the authority of court ordered warrants behind it. Put up or shut up, Omar. Another person obsessed with Omar. Did he turn you down too? He comes out of your mouth so often, that it makes you look like a joke. Oh wait, you are a joke. >One only needs to look at his Facebook comments taunting D7 rep Tam Nguyen hours after his loss, to see that Omar is probably not the best person to display concerns about this type of behavior. Not sure if this is just a rumor, but someone told me Maya is stamp licking Shirakawa’s niece. I checked Omar’s FB, everyone screenshots it duh(looking for newstory), it was Omar Vasquez, a leftist activist who ran against Tam who posted the comments. D5resident is a racist. Not all Latinx people look alike. Apparently, there were no Catholic priests or altar boys involved. Go back to your homes. All have John Shallman who has boasted how he can torpedo anyone. The new normal from punks like Torres. Torres is an elected official, well positioned, and could have ruined Bauman. bertlovesomar, bertlovesomar, bertlovesomar. Did he turn you down when you asked for a date? Why is Ellison still there?? Either you #BelieveWomen…in all cases, or you are hypocrites. There is no exception to the hashtag. It honestly seems like Dauber/Khanna have no role to play here other than try to make this about themselves. Speaking of Democratic Party Sexual Misconduct . . . .
Californians will just have to make do with Eric Bauman’s horn doggery until the Clinton circus arrives in Los Angeles on May 4. Is your comment a response to an SJI “request for comment”, or is it a spontaneous, unprovoked comment? I have never received a “request for comment” from SJI. Do they like you better? When the US Ponzi economy collapses, the riots break out, the concentration camps open, Civil War 2.0 starts, and WWIII begins will you say that you tried to warn people of the dangers of debt, war, and tyranny or will you say that you just sat there and did nothing? Everyone is born for a reason.